I am expecting a short term break down. Further details are explained well on the chart. Details are well described in the post. A short term sell is possible. However, keep in mind that the pair can go more up during the days to come. A sharp pole with a consolidation pattern. This resembles me more like a flag structure. If it breaks we it may create new highs. USDJPY: We Can´t Writeoff the Possiblity of a break up. To be considered a continuation pattern, there should be evidence of a prior trend. Flags require evidence of a sharp advance or decline on heavy volume. Check out the chart and see the possibilities. AUDJPY: 1 hr chart, short term bullish pattern formation. I found a technical charting pattern that looks like a flag with a mast on either side. Let us see how it capitalizes. Broke out from the consolidation zone with heavy volume directing upwards. Opko Health INC: A sell opportunity. There are two different types of breakout possibilities.. In case of breakout, wait for a pullback to enter the trade. Further details are recorded on the chart. AGI: Alamos Gold: The Game is Not Yet Over! Alamos Gold Inc. Is a Canada-based company, which engages in the acquisition, exploration, development and extraction of precious metals. But, for me after a great fall, there exists a possibility of a strong recovery. A break over the red line could be a positive sign to buy this stock. Most probably this stock is in the recovery stage. If it doesn't, then we can anticipate a move heretofore the death rattle. A break above the red line may expose to 127% of the fibo extension. Let us closely watch this pair and see what happens. 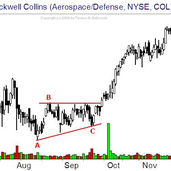 Alcoa Corp AA: Can We Rule Out the Possibility of a Breakout? I think this stock is running the correction stage. A breakout can take this stock to the level 39-40. Let us see how it works out. XLU is a massive, highly liquid fund that only invests in utility companies that are included in the S&P 500. It is one among the cheapest and most liquid options. I am expecting a structural break down. Will only enter if the relative upward strength or the volume of the pair runs out. I have identified the same structure on RSI below. Have a look. Flags happen to pause the direction of the trend. However, after the break it will continue in the same direction of the main trend. I wait for the flag to break downwards.